Accessories have the power to make or break an outfit — or at the very least, they can give your look just that extra bit of somethin' it was missing. With pearls and chains and ribbons and bling, this Zara number may look like a whole lotta of necklace, but it's just the statement piece that could give your ensemble the lift you didn't even know it needed. As ladies who tend to pine for the look-at-me baubles our favorite red-carpet fixtures so often sport, we're happy to see that this budget option is just as impactful on the eyes, if not on the bank account. For less than two Andrew Jacksons, we'll be making our basic tees pop and sheath dresses shine. 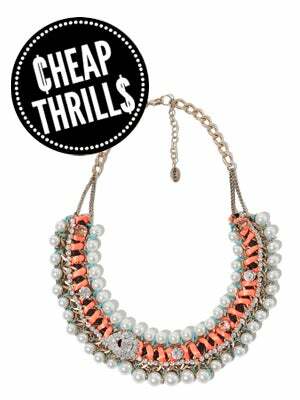 Zara Chain Necklace with pearls and crystal stones, $35.90, available at Zara.